High altitude platform station (HAPS) is a wireless repeater in the air. It can play a dominant role in observations, remote sensing and communication. High altitude platform station (HAPS) is a wireless repeater in the air. It can play a dominant role in observations, remote sensing and communication. The structure and composition of formation of HAPS are studied in this paper. 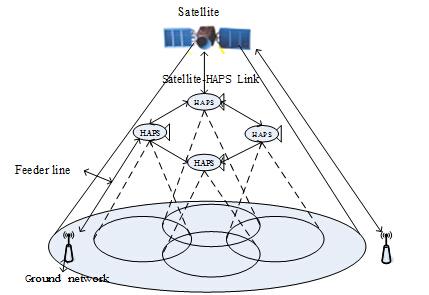 The performance of the wireless communication links are researched. In a recent paper by author Dr Xiaoyang Liu. Much affected by seasonal change and geographical location.Link budget calculation parameters are determined. And did not describe the statistical characteristics of the rain. This could lead to a prediction error in the process. Second, the elevation also has a great influence on the link performance.Due to the tilt paths, elevation Angle decreases. To increase the free space loss and rain failure. In addition, the shadow is also influenced by the elevation, so elevation changes cannot be ignored. Especially when working in low frequency band, so the lognormal distribution statistics fading margin should be considered the slow change. The HAPS have become the focus in the wireless communication in recent years. Next we will mainly study the following key technologies:The capacity of HAPS three-dimensional modeling and target characteristics of electromagnetic scattering in near space of HAPS. A paper about the study appeared recently in Mathematics and Computer Science.